Perspectives, Issue #011--Linda Jackson, opal jewellery, paintings and textiles. "Perspectives" - Linda Jackson, Opal Jewellery, Paintings and Textiles. The year rushes by...artists are busy and trying to not notice the recession/depression too much! In a way they are better placed than some as the pursuit of money is not usually their motivation for getting out of bed in the mornings. They are fortunate that lack of it is not a deterrent to engaging in creative and meaningful activities...and, hopefully, they won't let the consequences of world corporate greed worry them too much. Mind you, even though material possessions may not rate very highly for them, artists still have to eat and pay their mortages! Now the time has come to offer artists' work for sale. If you visit the virtual art gallery page and follow the links from it you will see that I have built several pages about the work of Tania Heben, Jill Booth (me) and Linda Jackson. Terry Johnson is next. There are forms so that you may write directly to the artist, or order an artwork - or two? Most artists will also listen to reasonable offers or agree to "lay-by" arrangements, so there has probably never been a better time to snag a bargain! Some more good news - Terry and Nancy Johnson are coming soon to live in Port Douglas for a year or two. They were so popular amongst the viewing public and artists when Terry was Artist-in-Residence at the Go Troppo Arts Festival last October that I am sure they will be welcomed with open arms. The Go Troppo Arts Festival has been awarded a small amount of funding from Queensland Events (hooray!) but is still in great need of financial and in-kind support. We thought of not holding the festival this year because of financial doom and gloom. But then we concluded that it would cheer everyone up! If you or anyone you know can assist with donations of cash or time please let me know ASAP. Linda Jackson recently lent me her digital archives of past work, in preparation for my building her virtual art gallery on my site. 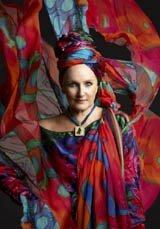 What a privilege and exciting experience it was to have a glimpse into those heady days of youthful brilliance as she and Jenny Kee collaborated on fashion from their Flamingo Park boutique, then, later, Linda from her Bush Couture headquarters. Her pages aren't finished yet - far from it - but enjoy Linda's virtual art gallery and follow links from there. This week Linda is in Sydney for the launch of her most recent range of opal jewellery, in collaboration with Guilians jewellers and Vogue Australia. Linda has enjoyed a long relationship with Vogue magazine and this week they have a four page, stunning spread about the launch of the new Lightning Ridge jewellery range and fabulous photos of Linda, looking very exotic. Here's one. 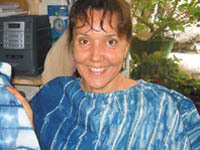 Linda often teaches in Port Douglas and Mossman as well as exhibiting in Cairns. Usually the classes are about the dyeing of silk and cotton with natural dyes such as red mangrove root, cochineal and indigo. Here is artist, Anna Curtis, draped in her indigo dyed fabrics and a sample by Jill Booth. 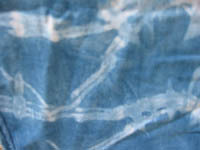 This month I shall let Frieda van Aller, a very successful indigo/shibori practitioner, have the last word on the meditative shibori/indigo dyeing process with her observant haikus. YES! you may forward this email to your friends. They, also, may wish to subscribe to the newsletter by visiting the Art in Tropical Australia home page.